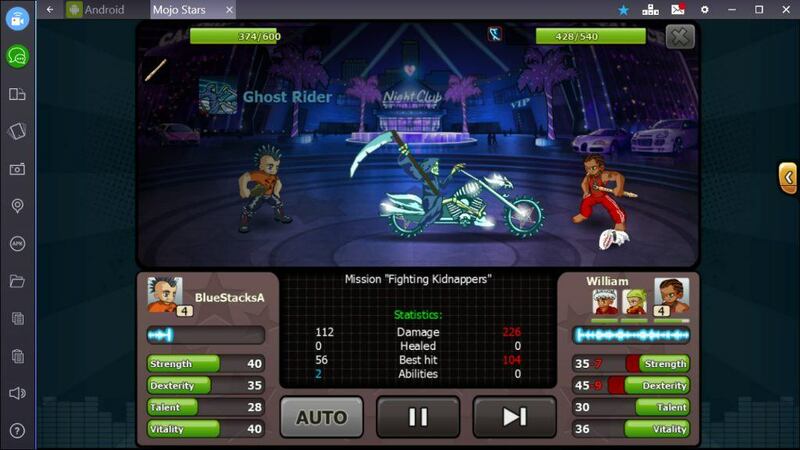 Mojo Stars is the the mobile version of popular Facebook MMO game called Music Wars. Choose a music genre, train your team to boost your mojo, then compete with others PVP style fighting and conquering all other bands. 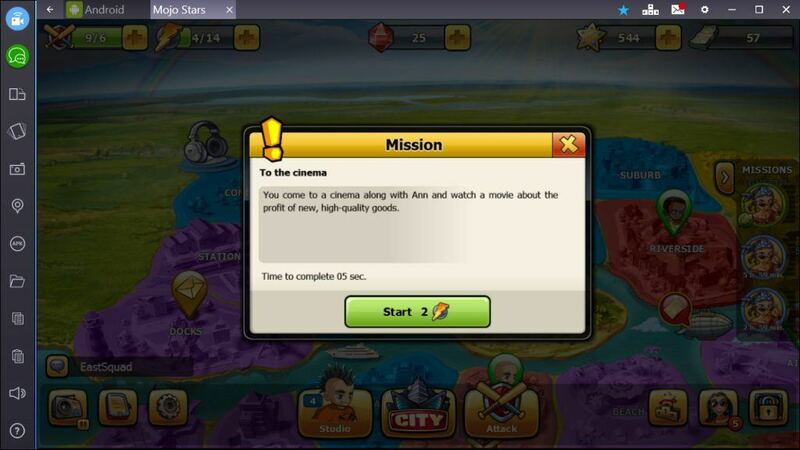 Play Mojo Stars on phone, tablet or PC via BlueStacks and let’s get into the review! Collect and build your team to fight in band wars against other players! Many great stories and missions! Overwhelming amount of missions and things to do which can make it difficult to understand goals. Mojo Stars is a comical take on story-based RPG fighting games. 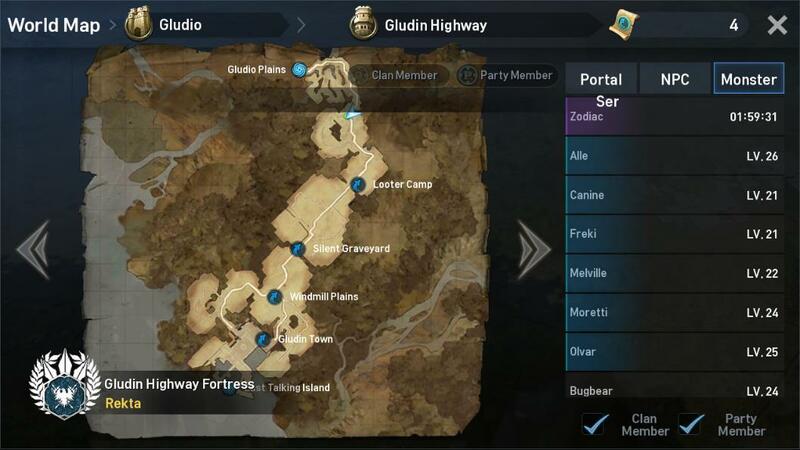 There is a lengthy tutorial guiding you through just how to play. You will recognize some familiar characters from television & movies too such as Doc Brown or PhD. Sheldon. When you initially start the game you must choose a faction: Rock, Urban, Club, or Pop band. Fights: determines the number of attacks on other players. Any character receives 1 fight every 15 minutes. During the Drive, VIP card owner receives a fight in 4 minutes and a common musician in 6 minutes. Purchasing licenses allows you to perform more territory battles. Energy: is required to attack other players and carry out missions. VIP card owners have their energy regeneration rate doubled. Energetic drinks can instantly restore your energy reserve. Rubies: are the safest currency, meaning they cannot be stolen or raided. They are used to buy a VIP card or pay for additional in-game functions. Rubies can only be obtained in the Bank. Each customer receives free rubies and a bonus! Stars: are a very valuable currency. They cannot be stolen or raided! Certain items and services can only be brought using stars. Stars can be earned by completing missions and participating in tournaments. They can be brought for rubies in the exchange office. Credits: are the main source of in-game currency- it can be earned or stolen by attacking other musicians. A certain part of robbed credits remains on your personal account (5% for general and 10% for VIP card owners). Buy a hidden stash in the shop and a part of your credits will be unavailable to raiders. A large part of your activities will be in completing missions. Much of it is dialog you read so get over it… Anywhoo, after reading to understand what the mission is you will execute to earn things like XP and more. 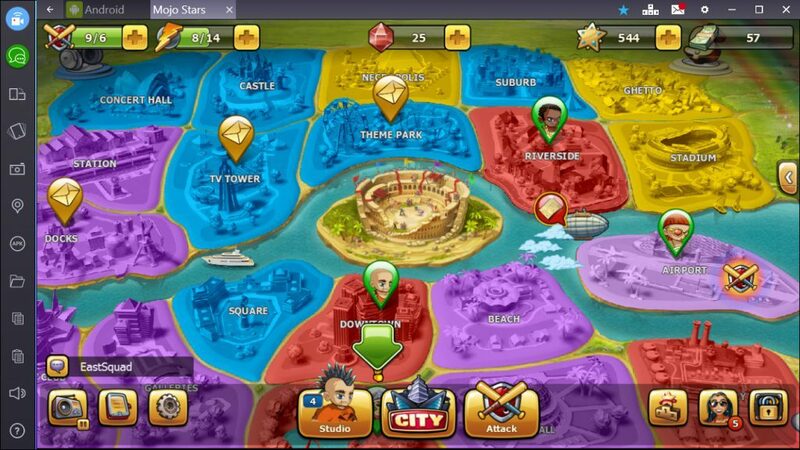 The City houses activities like Roulette, Genetics, Beauty Salon, Clubs, Shop, Lab, Band and Master. They all have their various purposes throughout the game. However, we’ll expand on one… Masters allows you to choose a personal trainer to earn and learn Abilities. Collect all to be the most powerful band member. By attacking others you can earn an array of items. When in the Attack screen it plays automatically, so you will generally be watching the bouts. The winner typically is the members who are statistically better (remember to continue to build your band member stats). If you fail just remember to train in the Gym, improve your equipment in the Lab, enhance your spirit with refreshing drinks in the Bar and the luck will be on your side! Aside of Missions, the City and Attacking will spend a lot of time in your Studio, the Gym and the Bar. The Studio houses all your Inventory such as equipment like weapons and studio gear. It also houses all your Abilities earned. You can upgrade these in the Lab located in the City. Located in this area is the Gym, which is a method of training your heroes in the areas of Strength, Dexterity, Talent and Vitality. These cost credits to purchase. The Bar is where power-ups are served up in liquid format which cost Stars to purchase. Keeping these healthy leads to more fights won for your band. Should you download Mojo Stars? Yes! There are so many aspects of the game we only touched on briefly. It will keep you involved with farming the game for the ultimate band. Though the fighting is not something you necessarily control through skill, it is something you strategically control in building your band, weapons and abilities before entering matches. If you enjoy story-based RPG titles then this is one for you. 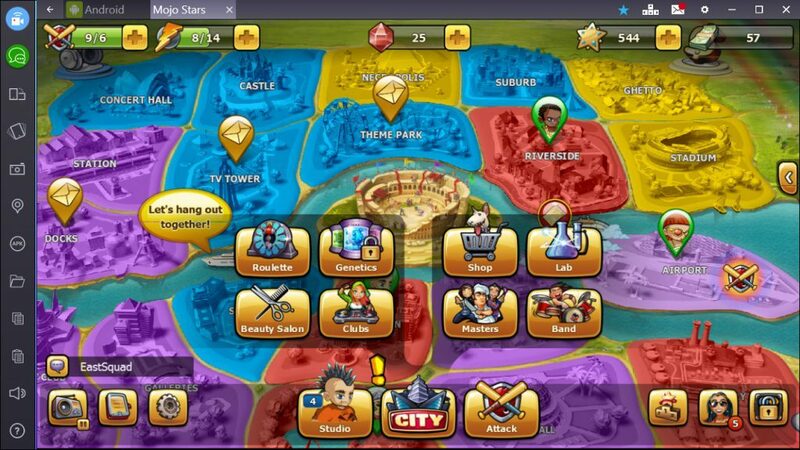 BlueStacks is the best way to play Mojo Stars on PC… download now!